Copy and paste the embed code below. The code changes based on your selection. A longtime acquaintance of Uzbek-born Sayfullo Saipov says the man police suspect of killing eight people and injuring at least 11 others when he plowed a rented pickup truck through a bike lane in New York City on October 31 had verbal run-ins with others in the Uzbek immigrant community and was a "little aggressive." Mirrakhmat Muminov, a fellow Uzbek and permanent U.S. resident who met the 29-year-old suspect shortly after Saipov arrived in the state of Ohio in 2010, added in comments to RFE/RL that the fresh émigré was not “[very] religious” when he arrived. Saipov lived within a community of several dozen Uzbek families in Stow, Ohio, from 2011-13 and attended the local mosque “once [in] a while," Muminov said. He said he last saw Saipov about two years ago, in Ohio, although he spoke to him as recently as two months ago. After that argument, he stopped contacting us. We warned him over his radical views." U.S. authorities are poring over Saipov's background for possible motives behind what they say is the deadliest terrorist attack on New York City since September 11, 2001. Reports say at least one note was found near the damaged pickup truck at the scene, in a busy part of Manhattan, proclaiming allegiance to the radical group Islamic State (IS). Witnesses were quoted as saying the attacker shouted "Allahu akbar!" before he was shot and apprehended by police. Muminov said of the allegations that “no one understands how he became a terrorist” but speculated that Saipov might have been radicalized after moving to Florida in 2013. Muminov said Saipov appeared to have been educating himself on Islam and might have found extremist Islamic literature online. U.S. authorities are poring over Sayfullo Saipov's background for possible motives behind what they say is the deadliest terrorist attack on New York City since 9/11. “After that argument, he stopped contacting us," the source said. "We warned him over his radical views." The same source said Saipov "seemed to be in depression," adding, "He kept everything inside him. He isolated himself from the outside world." Muminov said Saipov received a green card while in Uzbekistan and moved to the United States in 2010, staying first near Cincinnati, Ohio, before moving to Stow. The Uzbek government reported that Saipov received the green card after winning it in the annual green-card diversity lottery. Muminov said Saipov -- who told him he came from the Uzbek capital, Tashkent -- spoke broken English and native Uzbek, adding that Saipov had poor Russian-language skills and did not appear to speak or read Arabic. Saipov began working early as a truck driver, he said, which is also Muminov’s profession. He said Saipov used to haul goods all over the country but more recently was driving only regional and local routes along the East Coast. Saipov was last working for a New Jersey-based trucking company, he said, and had set up residence in the northern city of Paterson, where Saipov's wife and three young children moved to from Florida. A marriage license filed in Summit County, Ohio, states that Saipov wedded Nozima Odilova, also a Tashkent native, in 2013. A source within Uzbekistan's security services who was not authorized to speak publicly told RFE/RL's Uzbek Service on November 1 that Saipov's mother, father, and 17-year-old sister were being questioned in that Central Asian country, whose president pledged full cooperation in any U.S. investigation of the "extremely brutal...terrorist act." He said he last spoke with Saipov about two months ago via telephone but noticed nothing unusual. Muminov said that Uzbek truck drivers routinely keep in touch, particularly while on the road, phoning each other to discuss the latest in their lives. “When we [are] on the road, we call everyone,” Muminov said. Uber, the ride-sharing service, also confirmed that Saipov worked earlier this year for several months as one of its drivers. 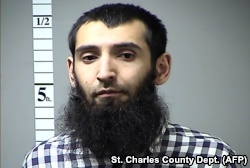 Muminov said a trucking company that Saipov set up in Ohio before it was closed down about three years ago was established merely to secure a USDOT Number, which is a requirement for individuals hauling interstate cargo in the United States. No one can imagine “what kind [of] monsters" were "in his mind,” Muminov said of the suspect, for him to have committed such a horrific act. Pete Baumgartner is a senior correspondent who primarily covers politics and sports in Central Europe, Central Asia, and the Caucasus. Radio Free Europe/Radio Liberty © 2018 RFE/RL, Inc. All Rights Reserved.